As I have mentioned in past posts, our household is all aflutter with H1N1 concerns. 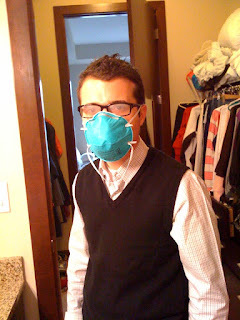 Several months ago, when the improperly named 'Swine Flu' became all the rage, my husband purchased masks. 20 masks in fact. 20 masks directly from 3M. Medical grade masks that could keep out even the strongest bio hazard. Below, please find our model, Jeremy Scott Frank, 5'3" strutting down the runway in this season's hottest trend. The H1N1 Mask. Complete with two head straps, this mask will not be blown off in the wind, and will keep you free of the flu. Though likely without friends. But I guess that's the trade off. Please notice, my favorite part of this photo. His glasses are fogged up due to his breathing into the mask and causing steam to rise into his glasses. Hot. T-2 weeks until my sister's wedding! The wedding programs are almost complete. Hope Jason doesn't mind that I forgot the 'a' in his name. Whatever. Not critical. We spent 2 weeks sorting out the Hebrew on the programs, so for those of you attending the wedding, you must now look at the Hebrew on the programs. And then I require you 'ohh, and ahhh' over the high quality Hebrew text. I will be standing up on the bimah. And I want to hear you all, from the pews, ohhing and ahhing. I may have had to google what a 'zayin' looks like versus an 'ayin' but that is unimportant. Zayin, ayin, vav, tav, same difference. The only ones able to read it will be standing on the bimah. But regardless, the the nun's are nun's and the tav's are tav's and you all better take that program home and frame it.